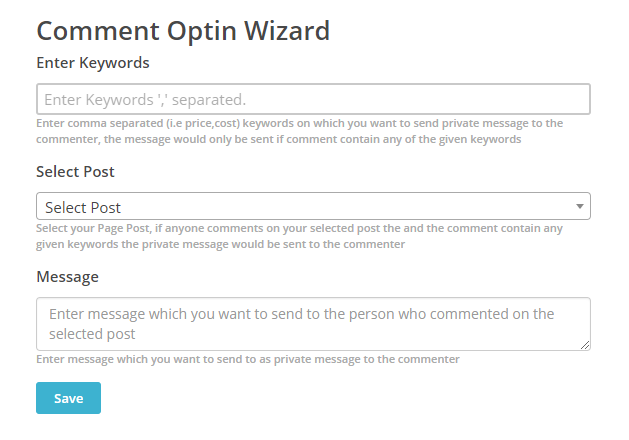 Comment Optin is a feature allows you to send a private messages based on the comment a user creates on any post on your page; by just selecting the post and keywords to match. 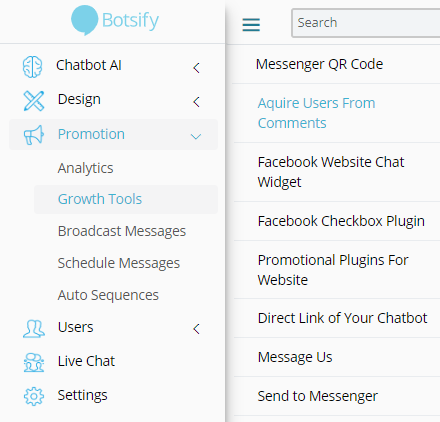 Go to Promotions on the side menu and click on “Growth Tools”. When the side menu expands, select “Acquire users from Comments” under Messenger QR Code. If you don’t have any previous Optins created, you will see this page. Now click on Create an Optin. Enter Keywords on which you want to send message to user who use them in the comments. Select Post on which the user comment matches the keyword. Type the Message which you want to send to user. Click Save. Congratulations, you are done. Now when a user comments they will immediately receive your message that you have setup.